Brice Quilt Bedding by C & F Enterprises | P.C. Fallon Co.
Lowest prices all the time, guaranteed! If you find a better price, let us know. Brice Quilt bedding by C & F Enterprises is a crisp plaid in shades of blue with white that works beautifully with any decor from traditional to modern. Binding trim at edges of quilt. Matching shams are sold individually. 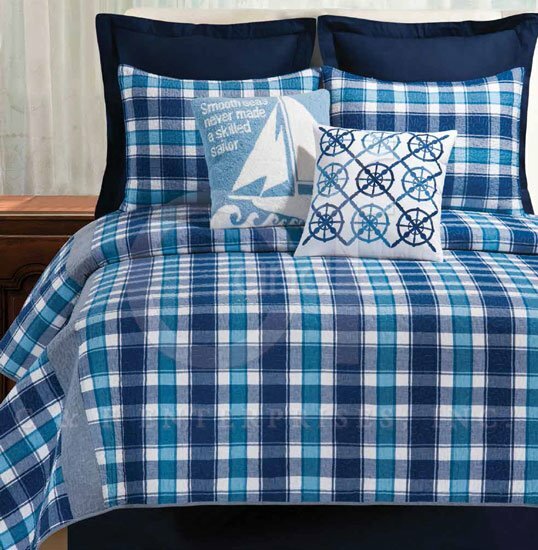 The euro shams and bedskirt in solid blue create a perfect backdrop for the fresh plaid design. Nautical throw pillows add the finishing touch. Made of 100% cotton and machine washable. Brice Full Queen Quilt is a crisp plaid in shades of blue with white. Binding trim at edges. Cotton Filled, Prewashed, Luxury Oversized. 90" x 92". Fits full and queen size mattresses. We offer the complete ensemble in the Brice pattern by C & F.